An international team of scientists including Hans-Rainer Klöckner from the Max Planck Institute for Radio Astronomy in Bonn and Dominik Schwarz from the University of Bielefeld have joined forces to lay the foundations for an experiment of truly astronomical proportions: putting together the biggest map of the universe ever made. The experiment will combine signals from hundreds of radio dishes to make a cosmic atlas. In a series of papers published today on the arXiv.org astrophysics pre-print website, an international team of researchers set out their plans for the mammoth survey. Researchers from the Cosmology Science Working Group of the Square Kilometre Array (SKA) have worked out how to use the world’s largest telescope for the task. 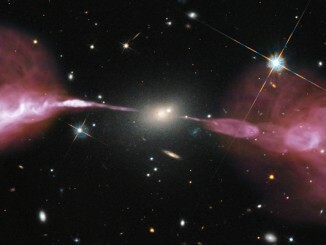 “The team has produced an exciting collection of cutting-edge ideas that will help shape the future of cosmology,” said Working Group chair Roy Maartens, from the University of Western Cape in South Africa. The SKA will be a collection of thousands of radio receivers and dishes spread across two sites in South Africa and Western Australia. When the first phase is completed in 2020, the SKA will have a total collecting area equivalent to 15 football pitches, and will produce more data in one day than several times the daily traffic of the entire internet. A second phase, due in 2025, will be ten times larger still. The key to mapping the cosmos is to detect the faint radio emission from hydrogen gas. “Hydrogen is the most common element in the universe, so we see it everywhere” said Phil Bull, from the University of Oslo in Norway. “This makes it ideal for tracing the way matter is distributed throughout space.” This includes the mysterious dark matter, which is completely invisible to telescopes, but can be detected through its gravitational pull on other objects, like hydrogen-containing galaxies. 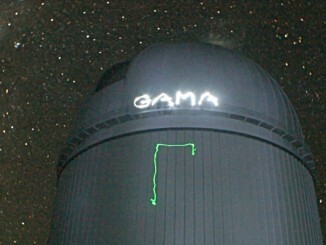 How to Map the Cosmos: Speed, or Accuracy? The standard way to map the positions of galaxies is to painstakingly detect the faint radio signals from many individual galaxies, staring at them for long enough to measure properties like their distance. Though time consuming, this method is the most accurate, allowing highly detailed 3-D maps of the matter distribution to be made. By the late 2020’s, the researchers hope to have found almost a billion galaxies in this way; in comparison, the largest galaxy surveys to date have mapped the positions of only around a million galaxies. An exciting alternative option being developed by SKA researchers, and others, is to rapidly scan the telescopes across the sky, sacrificing accuracy but surveying a much larger area in a short period of time. “This will only give us a low-resolution map” said Mario Santos (University of Western Cape), “but that’s already enough to start answering some serious questions about the geometry of the universe and the nature of gravity.” The results from this type of “intensity mapping” survey could be ready as early as 2022. For the astrophysicists, some of the biggest questions relate to dark energy, an enigmatic substance that appears to be making the universe expand at an ever faster rate. “The SKA will allow the most precise investigations of dark energy to date” said Alvise Raccanelli, from Johns Hopkins University, USA. “By using 3-D maps of the distribution of galaxies, we can study dark energy and test Einstein’s General Relativity better than any experiment so far,” he added. Characteristic patterns in the galaxy distribution allow researchers to make extremely accurate measurements of how the cosmic expansion has changed over periods of billions of years. Such a huge atlas of the distribution of matter in the universe will also open a new window to investigate the first moments after the Big Bang. “What happens on ultra-large distance scales tells us something about how the newborn Universe behaved when it was only a tiny fraction of a second old,” said Stefano Camera, at the Jodrell Bank Centre for Astrophysics in Manchester, UK. The measurements will allow researchers to more closely scrutinise “cosmic inflation,” the process that is believed to have sown the seeds of structures like galaxies and superclusters that we see today. According to the scientists, it’s not only by looking into the past that we can figure out how the universe works. “By observing a billion galaxies at two different dates, ten years apart, the SKA will be able to measure the expansion of the universe directly” said Hans-Rainer Klöckner from the Max-Planck Institute for Radioastronomy in Germany. The cosmic expansion happens relatively slowly compared to the timescale of, say, a human lifetime, so performing a direct measurement like this “would be a major technical achievement,” as well as providing more information on the nature of dark energy, said Klöckner. In addition to 3-D maps of the hydrogen radio emission, the SKA will also make two-dimensional maps using the total radio-wave emissions of galaxies. “These maps will contain hundreds of millions of galaxies, and billions in Phase 2, allowing us to test whether the shape of the universe is as simple as our theory predicts,” said Matt Jarvis from Oxford University, UK. Jarvis is referring to a series of fundamental physical principles, dating back to Copernicus in the 16th Century, which state that the shape of the matter distribution should look about the same on average, regardless of the direction you point your telescope. Recent observations have revealed troubling hints that this property, called “statistical isotropy,” may not hold however. “If this turns out to be the case, there would be very serious ramifications for our understanding of the cosmos” concludes Dominik Schwarz, from the University of Bielefeld in Germany. 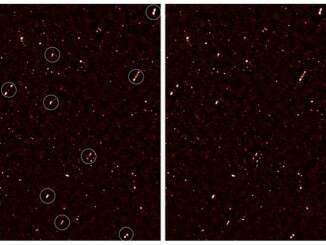 Deep radio imaging by researchers in the University of Cape Town and University of the Western Cape, in South Africa, has revealed that supermassive black holes in a region of the distant universe are all spinning out radio jets in the same direction — most likely a result of primordial mass fluctuations in the early universe. An international team of astronomers studying more than 200,000 galaxies has made the most comprehensive assessment of the energy output of the nearby universe. The Galaxy And Mass Assembly (GAMA) project confirms that the energy produced is only about half what it was two billion years ago and this fading is occurring across all wavelengths from the ultraviolet to the far infrared. The universe is slowly dying.